Every day, scientific breakthroughs are founded through the efforts of researchers across the country. Vital chiropractic research is also to the credit of the Canadian Chiropractic Research Foundation (CCRF), an organization working to broaden the scope of chiropractic knowledge, thus furthering the profession and contributing to quality, evidence based health care. Both the public and chiropractors alike are encouraged to support the CCRF to ensure the advancement of chiropractic research in Canada for generations. Consider becoming a partner with your family chiropractor to further necessary research that results in better health care outcomes. 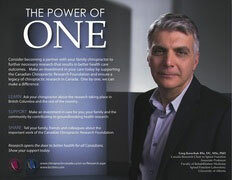 Make an investment in your care today by supporting the CCRF and ensure a legacy of chiropractic research in Canada. One by one, we can make a difference.